Final preparations are being made by 24 robotics teams about to compete for $3.5m (£2.3m) worth of prizes in a Pentagon-backed competition. Their machines are being challenged to carry out a series of disaster-related tasks in the shortest time possible. The US Department of Defence's Darpa research unit will host the event on Friday and Saturday at a location close to Los Angeles, California. A team from Google was a favourite to win, but has quit the contest. The squad of engineers' Schaft robot won the contest's previous round in 2013, not long after their start-up was acquired by the search firm. But the BBC understands that Google had concerns about being linked to a military-backed event, even though it is has a "humanitarian" theme. 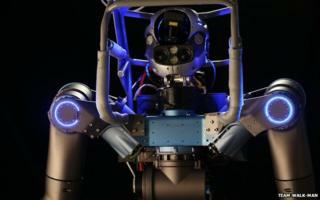 Google is, however, allowing six other teams to use a new version of Atlas - a robot made by its Boston Dynamics division. They will each power their copy with their own software. Each team will be given two attempts to complete the run. The crews can provide remote guidance - for example helping their robot identify the valve - but cannot control specific movements. While the tasks are similar to those in the last round, contestants now only have an hour to complete the circuit. And that is not the only change. "It is, in my estimation, 10 times harder than before," said Dr Gill Pratt, the challenge's manager. "We're not allowing any safety belays - the ropes that were used to stop the robots from falling over. If they fall down they have to not break too badly and get up by themselves. If they can't get up then the team is forced to take at least a 10 minute penalty and send the robot back to the beginning of the task. "We're not allowing power cords anymore - the robot has to keep all the energy on board using batteries. "And we used to have a fibre optic cable that connected the robot to the operator, and we modulated the connection's quality to give a little bit of difficulty. "What we're doing now is much worse. [The wireless link] is going to go between an on-connection and an off-connection. Imagine a cellphone where you hear one word and then for 29 seconds nothing before hearing one more word." The competitors will get a point for each task their robot completes and those with equal scores will be ranked according to their finish times. The finalists include teams from the US, South Korea, Japan, Germany and Italy. A crew from mainland China with a robot of its own design had also been expected to take part, but dropped out last week. However, the country is still represented by Team HKU, involving students from Hong Kong using an Atlas. "The core goal of the competition, to aid disaster relief, is applicable everywhere in the world, including China," team member Tommy Hu explained. "As the challenge is semi-autonomous, we've already noted a focus on how humans can best work together with robots to achieve a goal, which is very much on par with HKU's efforts to bring robotics into all areas including manufacturing and logistics." By contrast, Team Walk-Man is entering with a new machine built at the Italian Institute of Technology. It was funded by the European Commission and features custom-designed motors to give it extra power. Its leader, however, acknowledged that it was unlikely to win. Image caption The contestants will have to deal with simulated communications "blackouts"
"One of the tasks involves exiting a car - it's probably the hardest task as there's a very limited space and you have to carefully plan the robot's motions - and we didn't have time to try," explained Nikos Tsagarakis. His team will instead have to lift the robot out, which will entail a time penalty and a lost point. But he added that it was still worth taking part. "Originally the plan was to have the robot ready by Spring 2016," he said. "But because we entered the competition, we have accelerated development - it has helped act as a motivation to go faster." That point was echoed by Sabine Hauert from the Robohub project, which represents the wider community of robotics researchers. "The DRC is forcing roboticists to leave their laboratory environments to tackle real world challenges," she said. "This alone has helped greatly advance the state of the art and highlights the many difficulties still faced by robots today." For its part, Darpa acknowledges that it could still be a decade or more before the technology lives up to its potential. "The disaster response market for hardware is very small, and so what it typically does is adapt hardware built for some other purpose - the same way a fire truck, for instance, uses engines and wheels built for a truck of a different sort," said Mr Gill. "What we really need is a growth in the robotics industry for general use, and then the adaptation of that technology into disaster response. "What we are trying to do here is just to show what is possible." The BBC's Regan Morris is attending the event and will report on its outcome on Monday.